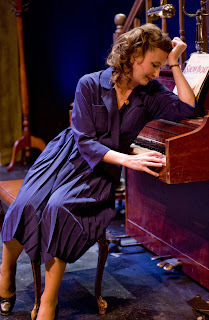 WELCOME TO THE GRIFFIN THEATRE COMPANY BLOG. THIS IS THE PLACE TO FIND OUT THE LATEST BREAKING NEWS AND EVENTS GOING ON AT THE GRIFFIN THEATRE COMPANY. It’s hot. A very, very hot sweaty tech. Twenty-seven actors crammed in a dressing room that is meant for about twelve sitting on top of each other in what seems to be a never-ending game of twister. Arms reaching for costume pieces, legs draped over each other and faces leaning towards the few fans trying to catch a breeze. This is our second day in the space, and I just received a note not to pull my dress up. I don’t even remember pulling my dress up during the run, I think subconsciously I was just trying to let any bit of air in to cool off. There’s even sweat between my fingers and I don’t feel very pretty. That being said, everyone is in really good spirits. We’ve been sardines in a can for the past six weeks and nary a temper has flared. It’s a pretty amazing phenomenon for this many people to be gathered in small quarters. This show is not for the claustrophobic. Tech. Deep breath. There’s no way around it. No more miming props or pretending to walk up and down stairs that aren’t really there or hitting the wall to simulate the door slam. We finally have all the real things. Trouble is we’ve gotten so used to all our imaginary bits and bobs that the real stuff throws everyone off. It’s that frustrating regression that strikes every show at this point in the process. Trying to find the rhythm, the new rhythm outside the rehearsal room. My shoes are slightly too big, and I stuff kleenex in them to make sure they won’t slip off while running up and down the stairs. My coat weighs a hundred pounds and I remember how much I detest nylons. I have new sight lines to contend with in a space that seems impossible not to upstage your fellow actor. There’s lights now and sound. And a ladder to climb in the dressing room to reach a perch to enter into the space from the bedrooms upstairs. Logistics. All logistics. Where’s the best place for costumes and props and how much time to I have to change between scenes? That’s what occupies my mind. In two weeks, this will all become second nature and we’ll laugh when thinking back to how horrifying it seems in this moment. But right now everyone is scrambling to get it right. Oh, and then there’s actually worrying about the acting part and playing the scenes. Making sure all that work doesn’t go out the window with your sanity. 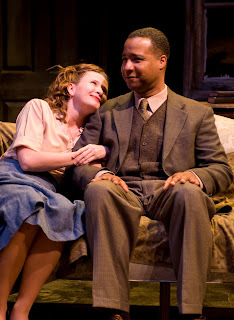 The first day of rehearsal our director, Robin Witt, called Stage Door a love letter to actors. I underestimated this play at the start and the depth of my character’s journey. It’s not exactly the 1930s romp I anticipated paying homage to all those films I watched growing up. It’s been an extremely challenging process that has struck at my very core. And I am just as stage-struck as the character I play. After 13 years of treading the boards of Chicago theater, I still believe in it and what it has to offer the community. Despite the struggle to pay bills and scramble for work, I wouldn’t trade it in for the life of me. My character states: “The theater beats me and starves me and forsakes me, but I love it. I suppose that’s the kind of girl I am--you know--rather live in a garret with her true love than dwell in a palace with old Money-bags.” Truer words could not be spoken. 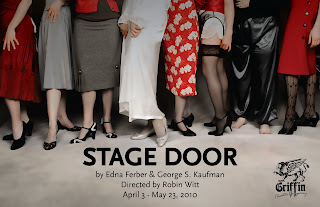 Griffin Theatre’s production of Stage Door by Edna Ferber and George S. Kaufman: 248 costume pieces; 33 characters; 27 actors; 16 set pieces; 13 door slams; 9 door bells; 5 phone rings; 4 bananas; 2 apples; a baseball bat; an upright piano; a two-story staircase; and 1 small dog. Bill Massolia, Griffin’s artistic director, phoned me up last summer and asked me if he was crazy. He thought the Griffin should produce Stage Door in the upcoming season. I had directed a staged reading of the play as a benefit for Griffin a few months earlier, and it had gone surprisingly well. Yes, I had to rehearse it in shifts, and yes, only 17 actors played the 33 roles. But the evening had been really, really fun (and oddly, on the night of my birthday). Amidst the fast-paced carnival atmosphere of the reading, there had also been moments of deep pathos. I said “yes” to Bill. Yes that he was crazy and yes, that I would love to direct it. 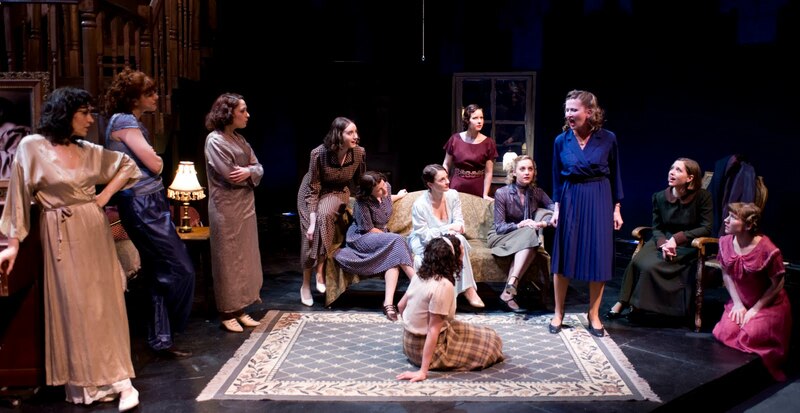 Set in a boarding house for actresses in Manhattan, Stage Door premiered at the Music Box in NYC on November 1, 1936. It was a time when the United States was struggling to pull itself out of the Great Depression and Hitler had recently presided over the Summer Olympics in Berlin. The world was a dark and uncertain place, and the theatre and film of the era were doing what they could to lift public consciousness away from gloom and despair. Ferber/Kaufman did their bit with some of the greatest comedies of the time, including The Royal Family and You Can’t Take it With You. Inspired by Ferber’s visit to the boarding house in New York where her niece–the actress Janet Fox– lived, Stage Door is an acerbic and loving look at the intoxicating, backstabbing, heart-breaking, and arduous life of show folk. · How is success measured? · Music. Dance. Drama. SHOWTIME! 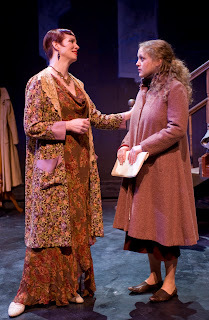 There is not a whole lot written about Stage Door (the play). Ferber/Kaufman’s other plays have garnered more attention and therefore more scholarly research as well. SD isn’t produced very often, except at Colleges and Universities. Why is that you ask? See the above list of elements needed for the production (elements=$$$$$). But there is also a very interesting tone issue in this play. SD is not pure comedy. It is not You Can’t Take it with You. SPOILER ALERT: skip to the next paragraph if you don’t know the play and want to come to the production without knowing key plot points. There is a suicide, and prostitution, and shattered dreams. SD also has elements of screwball comedy. Comedy and tragedy sit side by side and the switch between them can be razor sharp. How does one navigate through such ever-changing currents? Brooks Atkinson, in his review of the 1936 production, puts it best. After praising the play’s “keen edge” of comedy and its “ebullient” nature, he ends with a lengthy discussion on how badly actors were treated by producers. Atkinson writes: “Stage Door would be funnier if the whole subject of acting were less painful.” He spends 3 paragraphs in the review naming all that is wrong with the current hierarchal system of 1930s Broadway. It’s amazing. He pretty much predicts what is going to happen in the 1960s with the birth of repertory companies in the U. S.
Ok. Now it’s really late at night. More later regarding tone…..xo and goodnight. 1 in 27 - How do you fit all those cast members into the Griffin rehearsal space? 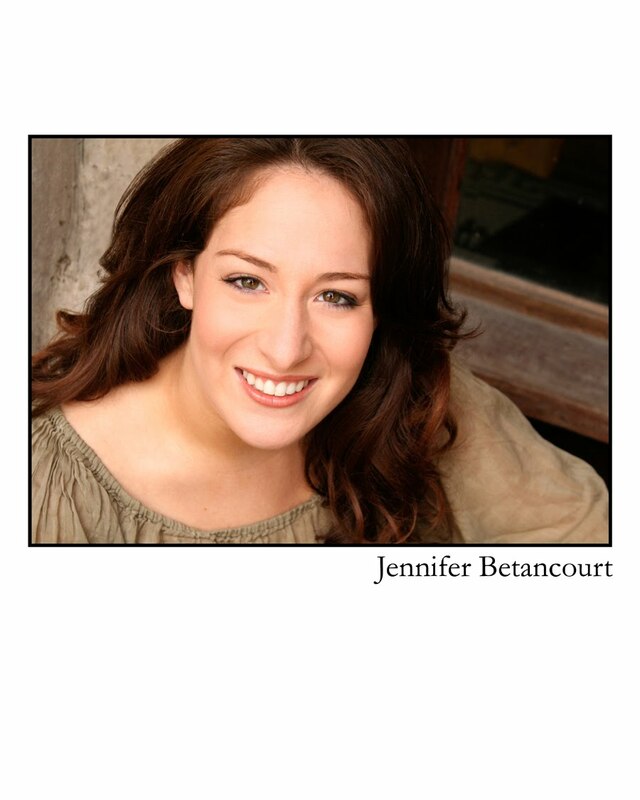 Jennifer Bettancourt plays Bobbie in our upcoming production of STAGE DOOR. 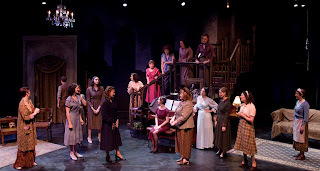 A recent graduate from Notre Dame, Jennifer provides perspective from one who is relatively new to the Chicago scene. After doing the staged reading last year, I feel really lucky and beyond excited to be able to delve into this script and get to know the characters and their relationships again, and much more fully. When we did the reading, everyone except a few were given multiple characters and, at least for me, it was like a really cool challenge to try and give each one their own distinction while sitting down and without changing costumes. This time around, I'd be lying if I said I didn't keep my eyes and ears open during the first few reads to see how these "new girls" chose to play the parts I'd done and perhaps it's petty of me to admit that I was worried I'd never be able to fully let go of the idea that I'd once said that line differently. As we've gone along though, it was beyond easy because of everyone's enthusiasm for the script and the story (no one more than Robin, and that energy has done wonders, at least personally, to make my excitement just continue to grow with every rehearsal). The ensemble nature of the show has made it essential for each character to know themselves in and out and embrace what everyone else offers. We're now in my favorite time of the rehearsal process: Books are dropped, blocking is done, and now it's time to string it together and explore and play! I've always been tickled at the idea of playing Bobby but the more we rehearse, the more I discover her and really dig the person we're becoming together (that doesn't sound too strange does it?) For example, despite what I think of myself walking down the street on any given day, when I think of being Bobby I immediately feel lighter, springier, flirtier, more in control of that flirtation, and really oblivious to time. It also works in reverse as I relate onstage the Bobby that is tempered by who I am as an individual. We also, meaning the girls of the Footlights Club (not me and my apparently multiple personalities), have spent enough time together in rehearsals to start becoming familiar with each other and it's exciting to see where different bonds and friendships are forming. It isn't that there are people NOT getting along (or maybe there are and I just am not cool or perceptive enough to know) but the substance of actually knowing and liking the people you're onstage with and why you like them, what it is about them specifically that makes you giggle or wince, is invaluable. In the upcoming weeks we will be posting interviews, rehearsal photos and directors note from our upcoming production of STAGE DOOR by Edna Ferber and George S. Kaufman. Check it out! The mission of the Griffin Theatre Company is to create extraordinary and meaningful theatrical experiences for both children and adults by building bridges of understanding between generations that instill in its audience an appreciation of the performing arts. 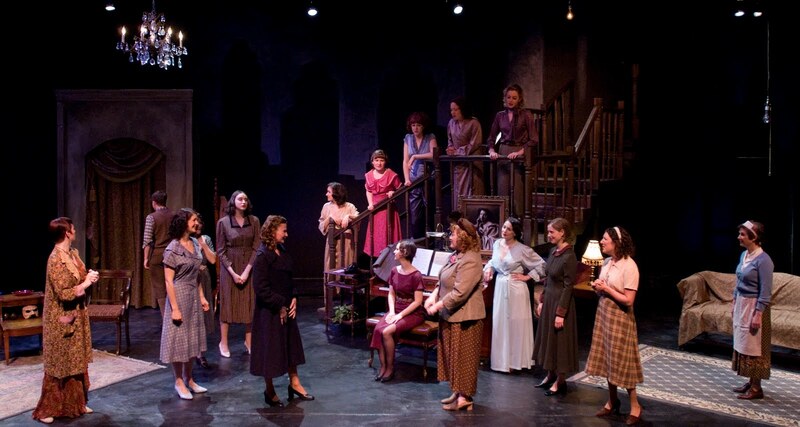 Through artistic collaboration the Griffin Theatre Company produces literary adaptations, original work and classic plays that challenge and inspire, with wit, style and compassion for the audience.